Finding your way around the guitar can be confusing. There are a lot of different notes and sorting them into patterns that make sense can feel daunting. To help cut through the fog we're going to take a look at scale degrees and the number system. The basic concept is pretty simple. A major scale (think the white keys on the piano starting at C or do, rey, mi, fa, so, la. ti, do) can be counted out as 1, 2, 3, 4, 5, 6, and 7. Each note in the scale, or scale degree, has it's own color relative to the tonic (aka 1, or "Do"). If this seems confusing to read about I think it will make perfect sense when you hear it. 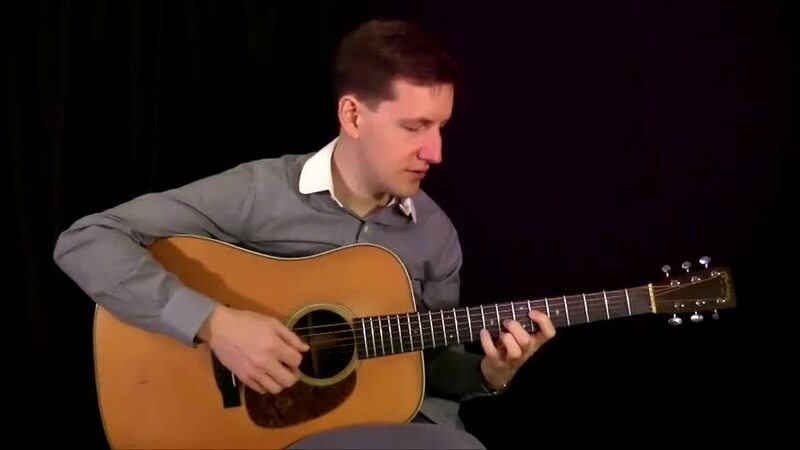 Having a basic grip on scale degrees will not only make picking out and learning melodies much easier, but it will lay the framework for understanding how and why chords are built. We'll also take a look at the melody of White Dove and how to decode it using scale degrees. Q: What will Chris be teaching over the coming year? A: From Chris: I'll be teaching many of the concepts and techniques, both large and small, that have helped me become a better musician and guitar player. For me to actually learn something, I have to understand why I should learn it. I'll discuss these concepts and techniques in the context of a song or arrangement, so that their relevance will be more clearly understood. In the first lessons I'll be starting out with basics, because I believe that every single musician will stand to benefit from stronger fundamentals. For instance, holding the pick is still something that me and my guitar buddies still talk about. You never master those things, but you should always be working on them. Eventually we'll get into more advanced topics like chord voicings, different approaches to improvising, building up technique, musicianship, etc. Over the course of the year we'll learn about 10 new songs, but each week I'd like to illuminate different approaches that can be applied to these songs. I'll also share what I've learned about singing and delivering a song to an audience. Q: What types of memberships do you offer? We offer monthly ($19.95 / month) and yearly ($199 / year) memberships. There are no minimum terms for either membership type (i.e. no obligations, you can cancel at anytime). Please see our Sign Up page for the details. 3. Click "To Payment Page"
After payment, you will have full access to all lessons. A confirmation email will also be sent from Sonic Junction confirming your new subscription. Q: What Awards has Chris won? A: Chris has won 3 International Bluegrass Music Awards and has been nominated for 3 Grammy's. Q: Who has Chris worked with? A: Chris is founding member of the The Punch Brothers and has worked alongside with Paul Simon, Renee Fleming, T-Bone Burnett, John Paul Jones, Marcus Mumford, Elvis Costello, Jerry Douglas, Del McCoury among others. More recently, Chris has recorded and toured with renowned jazz guitarist Julian Lage. Q: Does a membership give me access to all lessons? A: Yes a membership gives you unlimited access to ALL lessons from ALL Artists. Q: Can I take the lessons as many times as I want? A: Yes you can take the lessons as many times as you want. Q: Does a membership give me access to all Artists? Q: What happens if I stop my membership? A: When you stop your membership, you will be moved to a "guest" account. A "guest" account gives you access to everything on the site, except lesson videos. For example, a "guest" can see all of the tab and chord diagrams for all lessons, but will only be able to preview the first 60 seconds of lesson videos. Q: Can I cancel at anytime? There are no cancellation fees although there are no refunds for partial months. For example, if you cancel half-way through a month, you would continue to have access until 30 days from your last payment. Q: How does your satisfaction guarantee work? Sonic Junction has a 30 Day, 100% satisfaction guarantee. If you join Sonic Junction and are unhappy with your purchase for any reason, you can Contact Us and receive a full refund as long as it is within 30 days from your initial purchase date. Yes, we accept all major credit and debit cards. Q: Can I pay with my PayPal account? Q: I still have questions, how can I get them answered? You can contact us anytime via the Contact Us page. We will respond to your request within 24 hours, Monday through Friday.